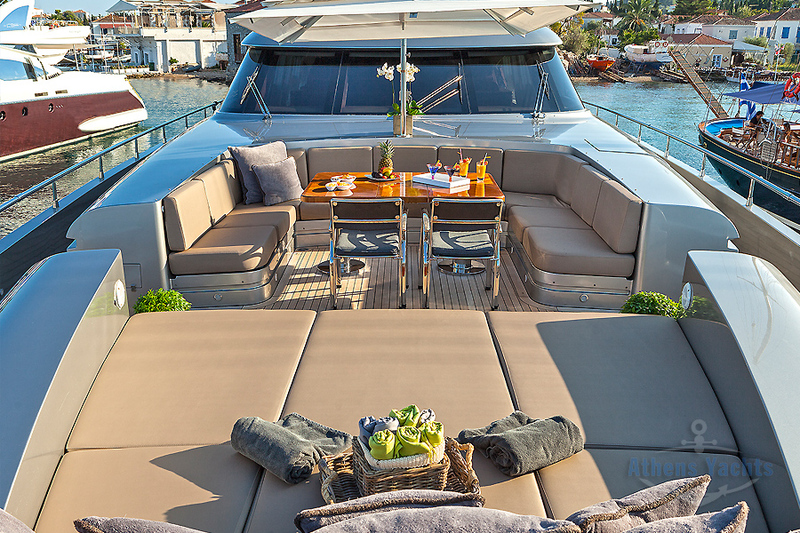 Enter the 140′ AB motor yacht, MY TOY’s saloon and the first thing you notice are the gorgeous dark brown floors, beige tweed ottomans, leather coffee table, enormous TV, and dining saloon forward, set with long stem wine glasses under a retractable sky light roof. The crew of six are all the same from the previous year, except Apostolis, the captain, who joined in early 2016. The stewardess uses the bar in the saloon to serve canapes, and there is a gray, spiral, Japanese screen, which sets up the focal point on the wall forward. 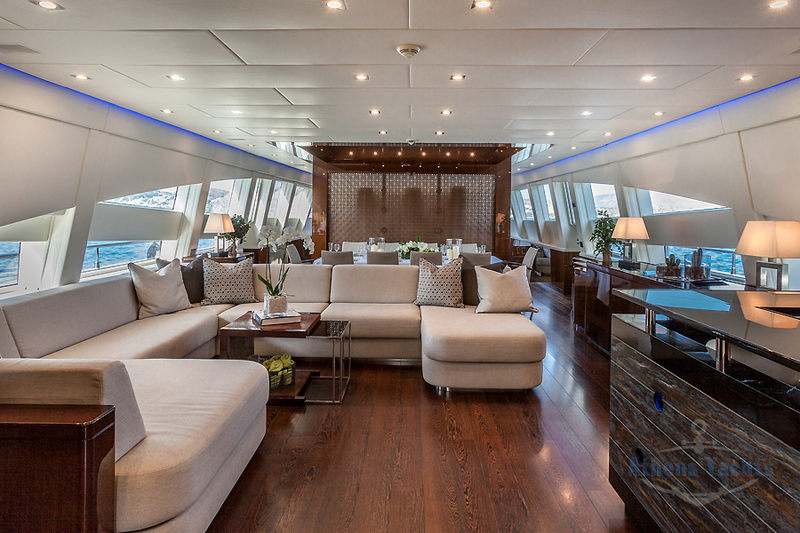 This wall does not go all the way up to the ceiling, so light flows in over the bulkhead from the sky light forward and from the windows all around Behind this wall is a private lounge with TV and the captain’s bridge. All is an open room. 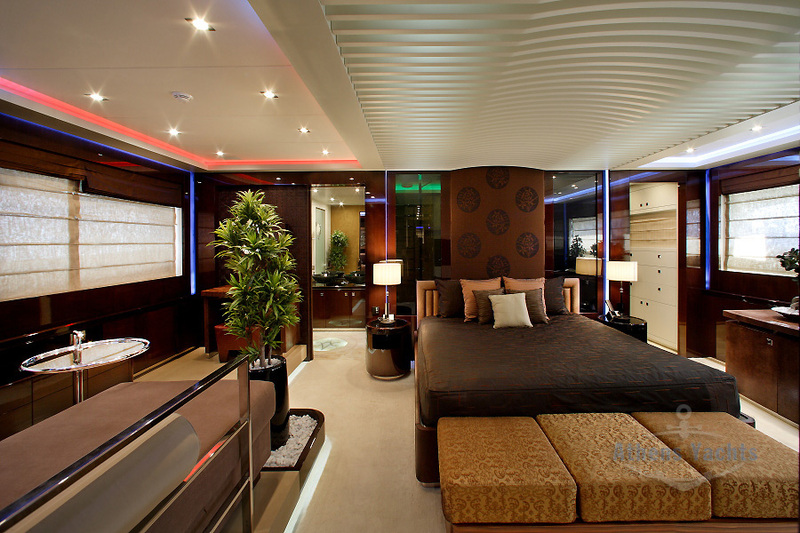 MY TOY accommodates ten guests in five staterooms below. 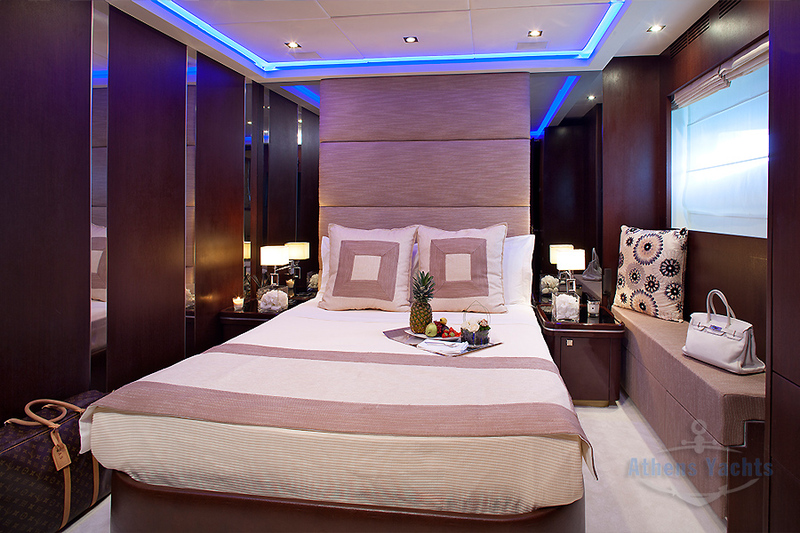 All the guest cabins on MY TOY have color therapy, including the full beam master, which is glamorous, honeymoon suite. 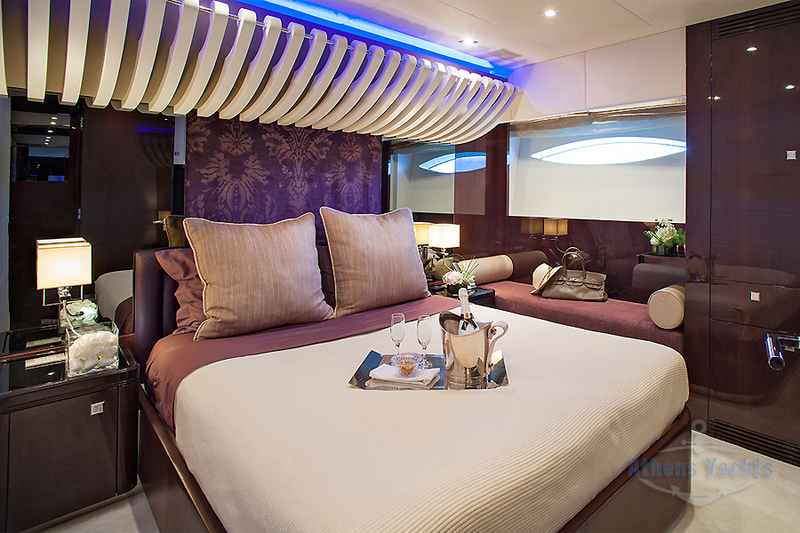 It has white carpets, a couch at the foot of the ample bed, white bedspreads, a lounge to starboard, dark cherry walls, a dressing room….velvet brown window treatments, tray ceiling, and a black and white bathroom, finished in marble. Bowl sinks, touch pad door, TV and wet bar. The lights dim and the black lights turn on…. 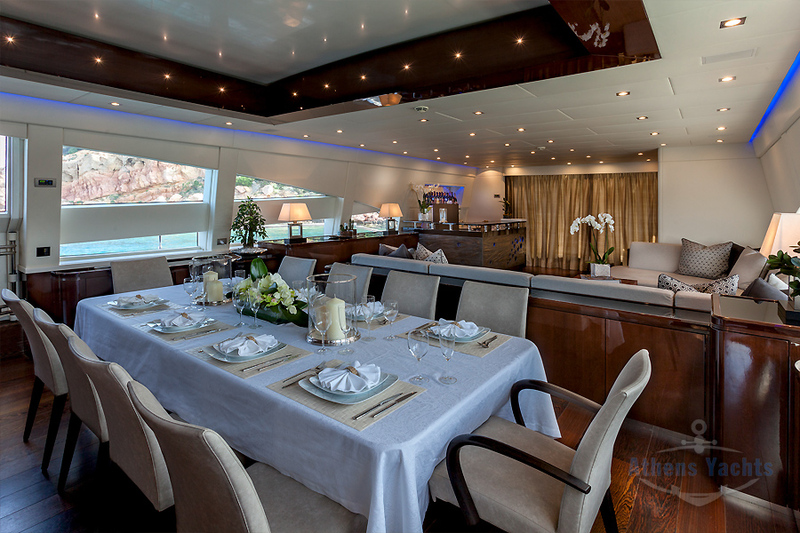 There are two Twin cabins additionally, as well as two VIP queen cabins, one a little larger than the other, each with bathrooms with white, marble, Alabaster floors….and tile shower. One has a sauna. One twin is larger than the other, and the colored lights change…. 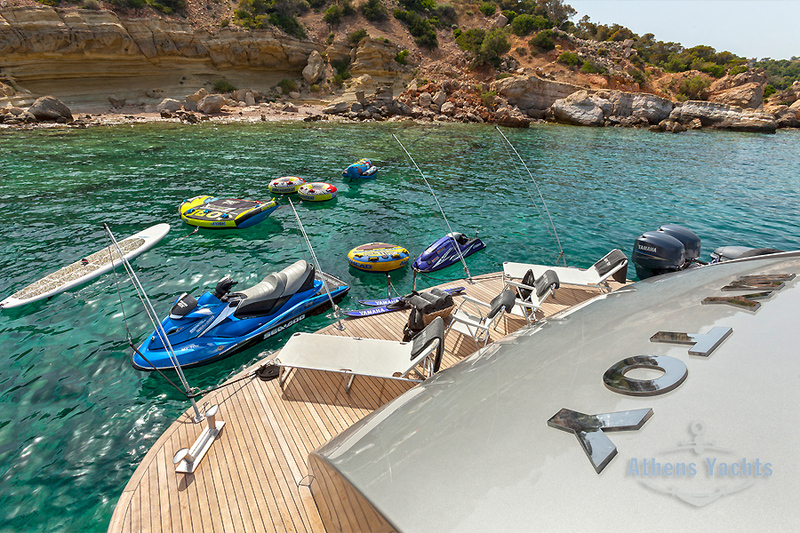 I would say that this yacht is striving (and successfully) to cater to the Romantic Couples charter market. 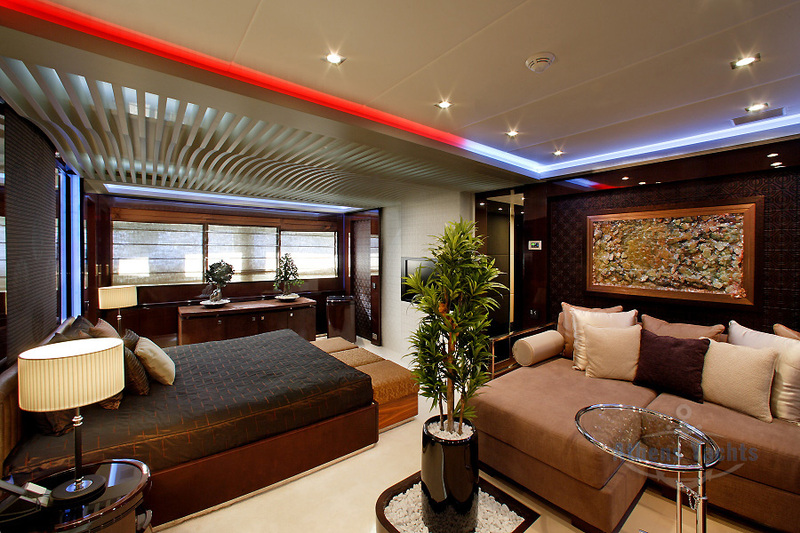 By employing multi-colored light options in each of her guest cabins, all of which are located on the accommodation deck below, MY TOY uses design to advantage. 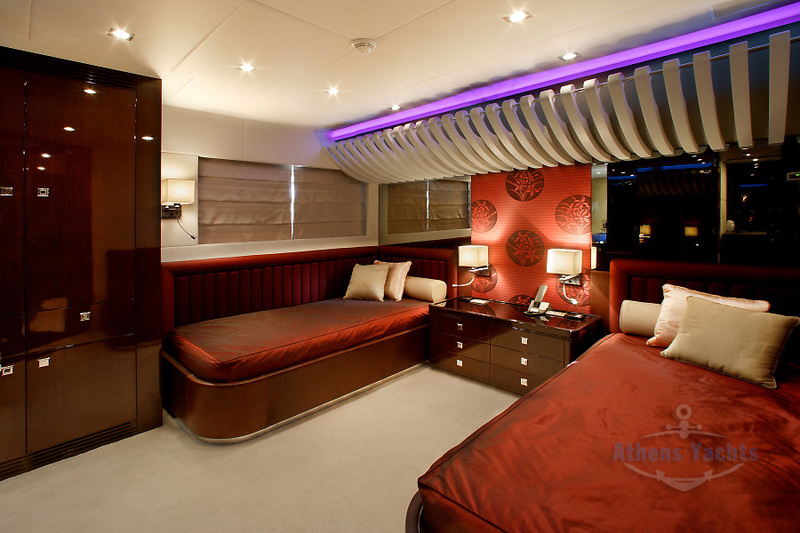 If you can’t have cabins located on the light and airy main deck, you might as well use the darkness of the accommodation deck to feature color therapy. 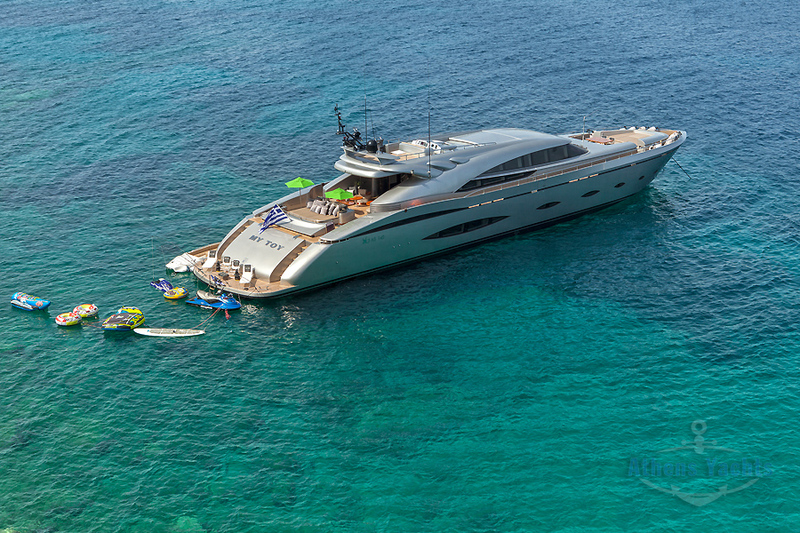 MY TOY is unique among charter yachts in this pursuit. MY TOY is a speed machine. 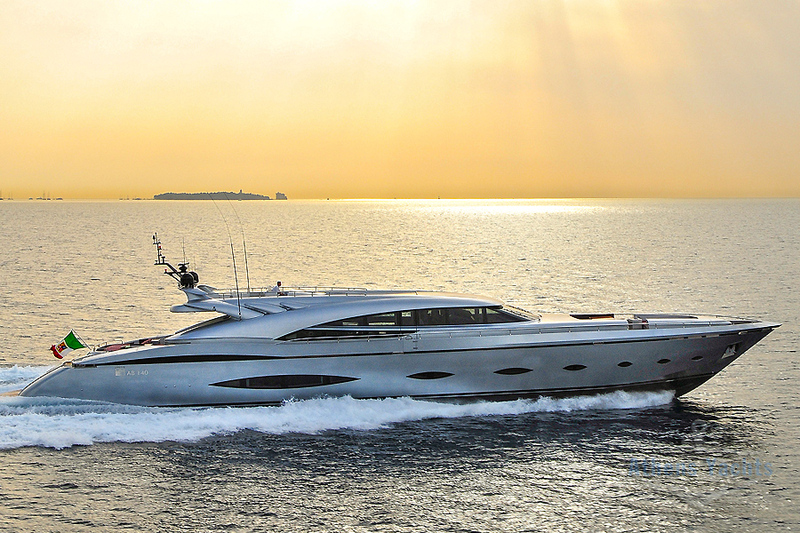 She has three, 2,400-hp engines with 1,000 hours running time on each. There is an upper sun deck. 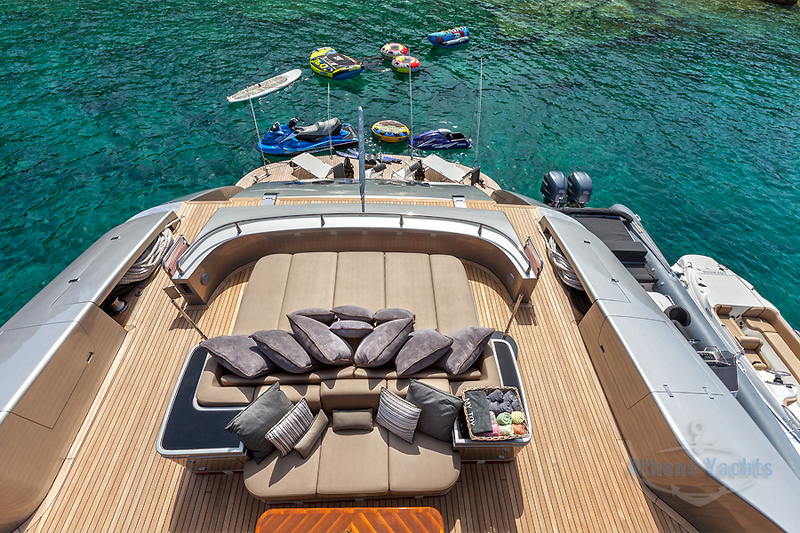 MY TOY cruises at 37 knots and can push to 42 knots! 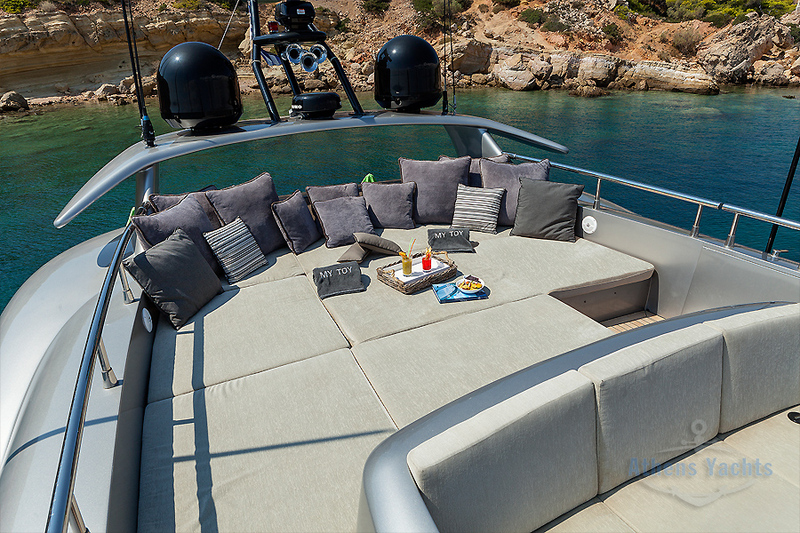 The yacht’s bow seating is a spacious walk-in area with a U-shaped settee around a dining table that can drop down and be fitted with cushions for sunbathing. An umbrella provides shade. 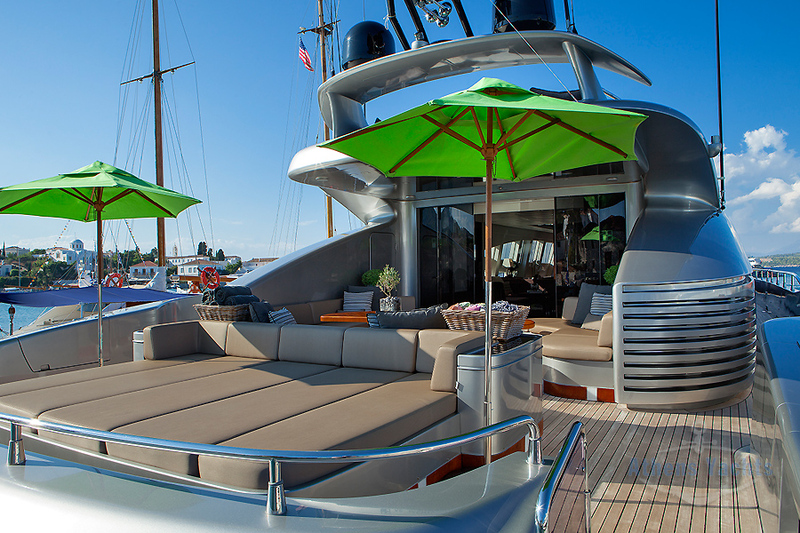 The aft deck also features a sun bed, bar, and great entertainment area.